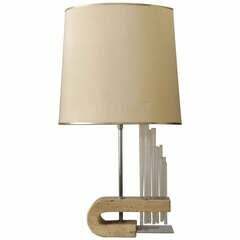 Louis Jobst' Monument Lamps are high quality, bespoke and handmade using solid raw materials. The bases are finished with a black patina and cut from 90mm thick steel billet. Markings from the process are visible and intentionally left, exposing the character of the material. A square block of Roman Travertine slots into the steel base. The opal glass diffuser is hand blown with a matte finish and contains a dimmable Led light source. 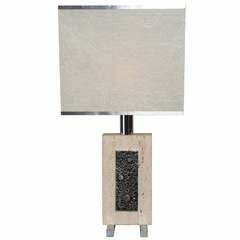 The concept was to design a lamp triptych made out of high quality materials for a formal interior space. A triptych of varying forms, colors and textures could create a 'common ground' throughout a space, whilst also working as individual lamps (circle, triangle and square). Inspiration has come from architectural forms such as monoliths and monuments, implemented through the design with heavy, robust materials and simple geometric forms. The lamps consist of stacked shapes, designed like a small column, with geometric capitals supporting the light source. The lamps precedent pay reference to Brancusi's geometric plinths and pedestals, and Chillida's square sectioned ironworks. 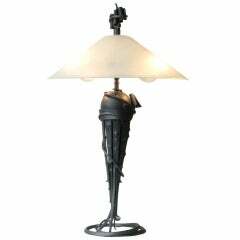 Monument lamps work in all types of spaces from classic to contemporary. They can be positioned on console, side and bedside tables or work very well in shelving units. Interesting 1970's italian table lamp Suspended glass pipes crossing the travertine base and get reflected in a chrome sheet. Ovale paper shade.